For pureblooded Harry Potter fans like me, the year the final movie came out felt like a huge loss. I was resolved to read anything—I mean, anything—that would still make the—any!—connection to the Wizarding World. I felt like I deserved to know more beyond that moment Harry’s kids boarded the Hogwarts Express. 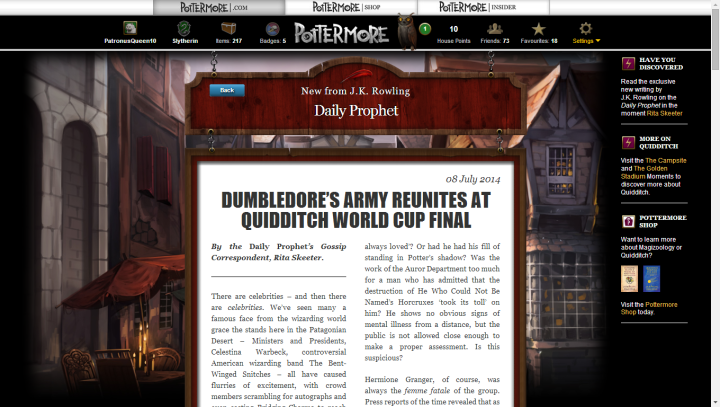 This is why when I found out Queen Rowling wrote an article about our beloved Dumbledore’s Army (and reports say she will be publishing another one about the Quidditch World Cup on Friday! ), it was like winning the Triwizard Tournament! (Okay, that might seem a little overboard, but still true.) Not only that it’s a glimpse on the current lives of the gang I have since forever loved—or rather, obsessed about—but it’s also written in that Rita Skeeter trademark! I missed the Wizarding World so much I’d take her bitterness against the trio to bring me back all the nostalgic amusement. About to turn 34, there are a couple of threads of silver in the famous Auror’s black hair, but he continues to wear the distinctive round glasses that some might say are better suited to a style-deficient twelve-year-old. The famous lightning scar has company: Potter is sporting a nasty cut over his right cheekbone. Requests for information as to its provenance merely produced the usual response from the Ministry of Magic: ‘We do not comment on the top secret work of the Auror department, as we have told you no less than 514 times, Ms. Skeeter’ So what are they hiding? Is the Chosen One embroiled in fresh mysteries that will one day explode upon us all, plunging us into a new age of terror and mayhem? Is it strange that I could not bring myself to finish reading the article because it was supposedly written by Skeeter? Haha! Hi Jeyna! A fair point. But then, it still is Harry Potter, you know! Hahaha! I seriously can’t stop myself from laughing. Haha! Hi James! Skeeterish or not, it was still awesome to see a peek of the Wizarding World years after!